The legend and his magic band were utterly majestic last night. Great to have experienced his humility and humour his kindness and his respect. Leonard Cohen skipping across the clouds doing his eric morecambe impression...what a fantastic night. This says it all!!!! !, Leonard Cohen was simply amazing!!!!. Our first time seeing him live, will not be the last!!!!! Such a wonderful, professional, warm, friendly and thoroughly enjoyable performance. BRILLIANT!!!!! Every member of his band were outstanding in their performance, it was such a pleasure to be there!!!!! Thank you to all involved in the tour. I managed to get Leonard's set list from Leeds last night with a list of 19 "potential changes" to the standard set list. Leeds got only In my secret life from this list of extras although it was pre planned ie on the set list rather than spontaneous. I also got an additional peace of paper showing lines from Joan of Arc and initials next to the lines to be sung by Leonard and Hattie Webb so clearly we were as close to getting this classic and my all time favourite in the set list. But close is just not close enough. Why oh why does it seem that there is a long list of extra songs every night but they are so rarely if ever performed. Will post links to the scanned copy of set list and paper re Joan of Arc as soon as I work out how to do so. mike.barker58 wrote: My only LC concert on this tour and, thanks to Jarkko and the tour promoters, I was in the middle seat of the front row in the central section. Firstly, a word about the arena ..... It's the best large indoor concert venue that I've been to - helpful staff, sensible parking arrangements and cost and a great layout. As for the concert, seeing Leonard and the band close up for the first time you appreciate the interactions between them - a smile here, a nod there .... Everyone clearly on the same wavelength and able to respond when LC throws in a new word or two to the lyrics or goes into a rap about surprising everyone if he turned up dressed as a concert pianist for Tower of Song. From the start Leonard was in playful mood and clearly enjoying himself .... for me, seeing an artist of his calibre enjoying the performance and the occasion enhances my enjoyment of the concert .... and I don't begrudge him the right to enjoy himself on stage, it doesn't detract from the performance in any way. It was a great night - ok we lost a couple of numbers at the end but given that the overall running time was the same as Cardiff it shows you how performances vary from one night to the next - the highlight for me was being able to see a master at work up close. I concur with all of your sentiments bar that one about the venue. There were some truly woeful seats in that place, particularly to the sides on the Floor level, as regards insultingly abject sightlines to the stage. How they had the gall to sell some of those simply bewilders me and I'd be very wary about purchasing tickets for that venue down the road. Anyhow, my wife and I were privileged to be located on the front row of Block C, just a few seats along from your position, for which huge thanks to Jarkko and the presale organisers. Enjoyed the renaissance of Anthem and the elongated rendition of Tower Of Song, complete with plenty of LC ad libs and an extended amount of 'Doo Dum Dums' at its conclusion. What was it LC said suring the latter song - something along the lines of "Ah, what a sweet opportunity for a rest" - as Sharon (and at one point, Sandra) Robinson and The (sublime) Webb Sisters serenaded him? He also wished that they could go on like this indefinitely and that doing so would make him (and his family) so much happier..! Born With The Gift Of A G wrote: There were some truly woeful seats in that place, particularly to the sides on the Floor level, as regards insultingly abject sightlines to the stage. Agree completely. We were on the front row, about half way across block B on the left hand side. I could see the stage OK (though Leonard disappeared completely behind the cameraman whenever he knelt down) but a couple of seats to the left and our view would have been blocked by the speaker stacks. The view from the side blocks (A and E) was almost completely blocked by the speakers and the curtained off side stage tech areas. Despite this, they had the nerve to sell the seats for the full price of £75 + charges. They even put a load of seats on sale on the morning of the concert when they must have had a good idea what sightlines would be like. Other facilities at the venue were woeful. There are no toilet facilities at floor level apart from 3 separate disabled toilets. Why oh why could then not have designed the place with adequate facilities at floor level for those on the floor and seated in the lower level of the 100 blocks? For those who could not manage to two blocks of stairs to get from lobby to floor level, there was one single wheelchair lift with barely room for a wheelchair + helper. The sort of thing you might find in a store that has added a disabled access at a later date. Not the sort of facility you would plan for when designing a multi million pound purpose built concert venue. There were still queues for the lift long after the floor had been cleared. It would take a very good seat for a show I really wanted to see to tempt me back the First Direct Arena, especially given the problems with sound that we experienced on our previous visit to the place. TommyJ wrote: I was in the 2nd row central, just behind you, Mike, and I fully agree with what you say about the interaction between the band members. That doesn't surprise but it remains remarkable. And they keep it so fresh. We may have missed a few songs but for me the main ones I really wanted to hear were performed beautifully. Ok, Democracy and Avalanche would have been nice but I'm just being greedy. Roll on o2! What was that heckler yelling when Leonard was apologizing for moving the concert? That was the low point for me. The concert itself was wonderful. I sat farther back and got to enjoy seeing how quiet and well-behaved the audience was. Best of all, no beer runs like in London. One show to go, but can't wait to hear the new songs and live in hope of a new tour. I miss Leonard and his band/crew already. Brilliant concert. As others have said, vocally he was superb: best I've heard. The screens were better than I remember from before: even though we were 10 rows back, slightly left of centre, there were still some parts of the stage we couldn't see (particularly the kneeling parts) but the quality of the diplayed images plus the actual filming more than made up for it. The only two downsides for me were the toilets and the encores. People were still queuing for the ladies when the band returned to the stage. Just not acceptable to have so few ladies' loos - the sink area was far larger than it needed to have been and more cubicles could have been put there instead. The encores: (and this comment might annoy some people who think I'm being a mardy spoilsport) - it was really frustrating when those in the rows in front of us didn't sit back down again after the standing ovation. Having had a really good (the best?) view throughout, they then prevented people behind seeing anything for all the encore songs. If you're only 5' 2" like me, standing up yourself doesn't make any difference - and what if you don't want to anyway, or don't want to block others' view, or are physically impaired and can't stand for that amount of time? The blokes in front of me were good six-footers, apart from anything else. Good job the monitors were so good. I think - I hope - people just don't think, rather than it being a selfish "I don't care, I want to stand up" attitude. Rant over: well done to all involved in putting on the concert. It was a far cry from the very first one I saw in '69, or thereabouts: just Leonard, on a stool. No backing singers, no musicians. Leonard, if you take a year off next year, you've deserved every minute of it, and thanks from us all. We thoroughly enjoyed the concert although we moved seats for the second half due to having a Perspex safety screen in our eyeline from our original seats. The sound last night was brilliant in my opinion. We were staying at The Queens Hotel and we were hoping that Leonard might have been staying there, we stayed in the bar until late but no sign, a poor substitute was the 'Pub Landlord' who was present ( Al Murray) Hope we get to see him ( Leonard, not Al Murray !!!) tour again, it is a sheer joy to see him and the band in action. Had an enjoyable chat with a young Security chap who said there had been complaints on Wednesday about the vocal sound for Elton John. Some great pubs in Leeds, thanks to Sue for organising the meet-up, very enjoyable time in good company. Jake Bugg coming up soon, he will do well to better last night. Crash Records: "An incredible Leonard Cohen gig at @fdarena #Leeds He is such a charismatic performer with some amazing musicians. An unforgettable night." Mel Marriott: "on the way home from seeing Leonard Cohen at Leeds @fdarena - lost for words trying to describe how amazing that was." We agree. Spellbinding performance from a true legend. Thanks to all who came and experienced it with us. @belgianbeerpete - Leonard Cohen at the new enormodome: it's the interval. Not just a gap between bands. A proper interval. @HarrogateGigs 19h He drops to his knees like Elvis in slow motion. At79 Leonard Cohen is the miracle. Leeds Arena loves him. @pollygary - Really enjoyed my night out at Leonard Cohen gig. Nearly 79 but wow, he can still cut it. Superb accompanying band as well. 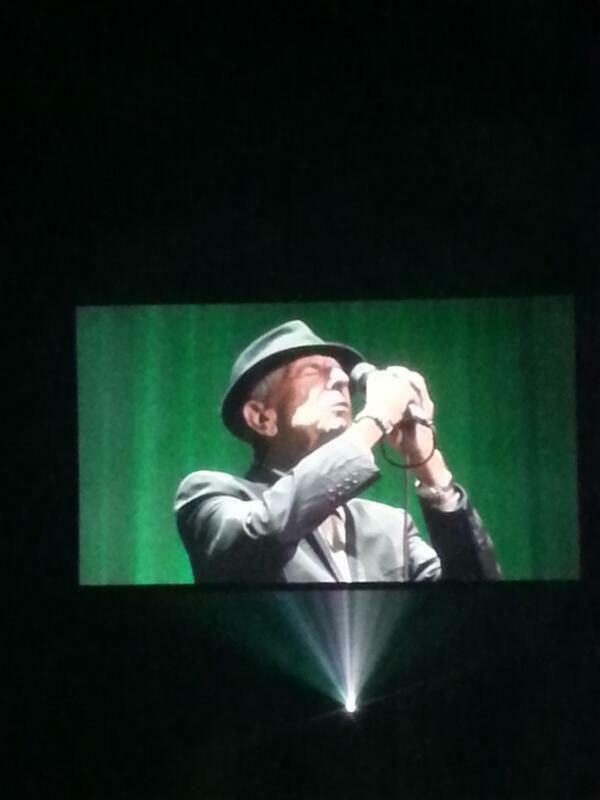 @ColinBeveridge – Leonard Cohen in concert was outstanding at Leeds last night. A class act and an experience not to be missed. Truth teller. @JailhouseChurch - Leonard Cohen was unbelievable. So glad we got Lover Lover Lover amongst other incredible songs. @Beeingabout - Amazing Leonard Cohen concert last night in Leeds. Songs, poems, musicians sublime! What a great man. @PaigeDolores - Definitely worth getting stranded in Leeds just to say I've seen Leonard Cohen. Nothing can top the performance he put on last night. @MickMcCann01 - Leonard Cohen was fabulous & magical at Leeds Arena last night, played for 3hrs - he's 79. And @fdarena your staff are brilliant. @davelee1968 - For those that missed last nights news, I went to a Leonard Cohen gig and it was a masterclass in magnificence. @melmarriott - on the way home from seeing Leonard Cohen at Leeds @fdarena - lost for words trying to describe how amazing that was. @SarahDunwell - Had the most amazing night @fdarena with Leonard Cohen...absolutely spell-binding and boy, can that guy sing! Truly great night. Thank You! @pollygary - Leonard Cohen gig fantastic. Hairs on the back of the neck for many songs. Awesome band as well. @Crash_Records - An incredible Leonard Cohen gig at @fdarena Leeds He is such a charismatic performer with some amazing musicians. An unforgettable night. @andywinter26 - Goes without saying that Leonard Cohen was utterly fantastic. But I'm saying it anyway. Because he was. Utterly. Fantastic. @culturevultures - How to do justice to Leonard Cohen's voice? I can still feel it reverberating through me. @royburgess40 - Some evenings of music lift the soul and make life more complete. Thanks Leonard Cohen - - consummate entertainer . @lawrencenotrin - I don't know what just happened. I tell I lie. I do. Leonard Cohen just happened. And I think i was born again. MOST spiritual experience. Last edited by sturgess66 on Mon Sep 09, 2013 4:08 am, edited 2 times in total. This was a perfect concert. I sat quite enthralled thinking I will never see a better concert in my life. I don't think you can score concerts out of 10 like some sort of Olympic sport - but if there was a panel of judges who had to award a final score - well, could they deduct any marks? The sound was perfect where I was sitting. Sharon and the Web Sisters were sublime. The set list was one highlight followed by another and another until the 3hour plus concert was over in what seemed like the blink of an eye. Leonard was on top form and very appreciative of his fans. I felt very privileged to have been there. Apologies to Caz, we were some of those who didn't sit down. In mitigation we would point out that as soon as LC left the stage before the encores people ran in to line up in front of the stage. The only way we could see is if we remained standing. From our point of view it wasn't as bad as Manchester for pushing but I fully appreciate how annoying it is for those behind, sorry. The wars they will be fought again in the maelstrom that is a Leonard Cohen moshpit. Last edited by sturgess66 on Mon Sep 09, 2013 2:36 pm, edited 1 time in total.